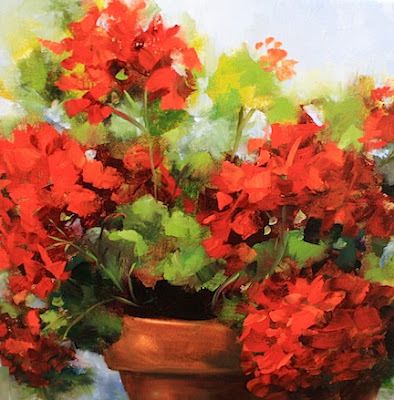 Marilyn Monroe Red Geraniums was my class demo today. 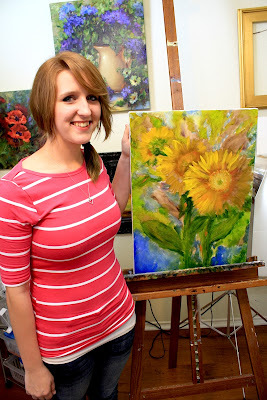 Nicole and Deanna and I spent the day painting geraniums, sunflowers, and pansies. We took some breaks to stretch our legs and throw the ball for Studio Director AnnieBee and then to have some homemade quiche and chocolate strawberry shortcake with whippy creme for lunch. Nicole is a senior in high school and had never painted before, but did a beautiful job with her lively, colorful sunflower painting. She really put her imprimatur on her work, selecting bold blue colors for the background and nice big leaves and stalks to set off her colorful sunflowers. 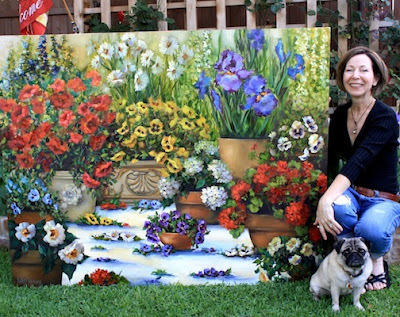 Deanna, her grandmother and my painty pal, has launched her new Web site and her art business is taking off so stay tuned for good things to come! I had two more paintings to finish after my students went home, and a big new painting to photograph in the garden. Camelia Rose Container Garden, 60X48, will be shipping to Art and Frame by Wood Gallery in Coronado, California next week for my art show on April 21. I'll be painting in the garden for my annual solo show that Saturday, and love visiting the island during the Coronado Flower Show. What a great place for flower nuts like me! Be sure to stop in and say hello if you are in the area. I'll be sad if I miss you! 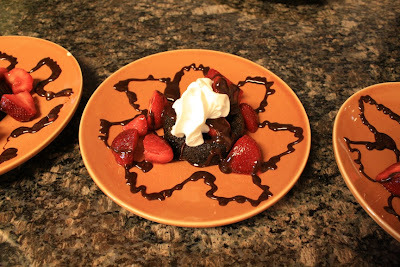 Chocolate Strawberry Shortcake - mmmm! What a slew of gorgeous paintings! Deanna's sunflowers are perfection too. What a talent she has! Yes, the strawberry short cake was a highlight but so were your pictures. They are all an inspiration for the rest of us. Especially while we wait for spring! !